When you’re a parent, it seems like there’s never enough time in the day. Juggling duties between the kids, secular work, household task, etc. parenthood is 24/7. Going all the time also means we sometimes mess up, especially when tired or under extra pressure. That’s kind of what happened to me last week when I was trying to get dinner ready for the family. One thing led to another as a series of parenting fails seemed to pile up. No mishaps occurred during the first two-thirds of preparation. 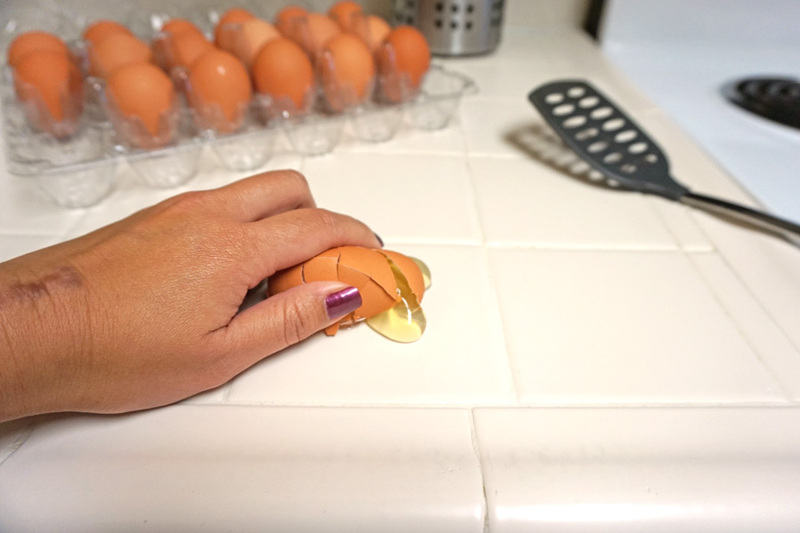 Then, as I was cracking an egg, I used a bit too much strength and smashed it against the counter. The egg yolk and whites spread across the tiles and oozed across the grout. In a moment of bad judgment, I decided to get a paper towel to scoop up the mess. I nudged the liquid over the edge of the counter and into my hand, just as I would have if it was dry food stuff. Not smart. 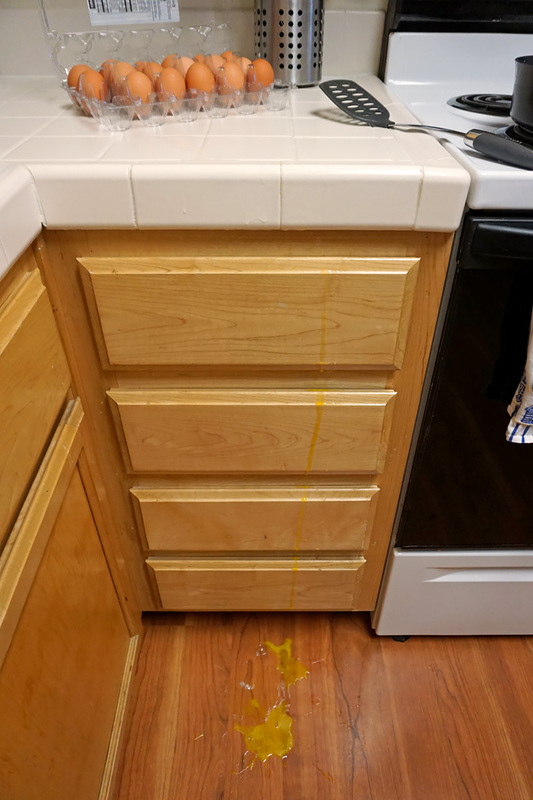 The egg seeped right through my fingers, down the four cabinet drawers, and finally ended up on the floor. 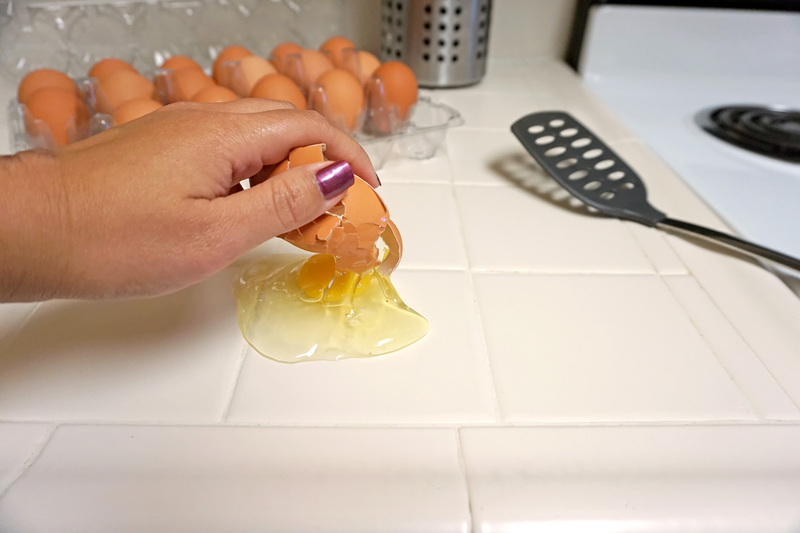 Not only did I clumsily break an egg, but now a thick, sticky residue was left in the aftermath. It really shouldn’t have been a big deal but, as things continued to get worse, I was seriously losing it! I quickly finished cooking the dinner so I could begin an emergency clean-up. I grabbed a Clorox Disinfecting Wipes (we always keep them on the counter just in case) and immediately went to work. I started with the counter and made sure to get every bit of grout as well. Then it was onto the drawers. 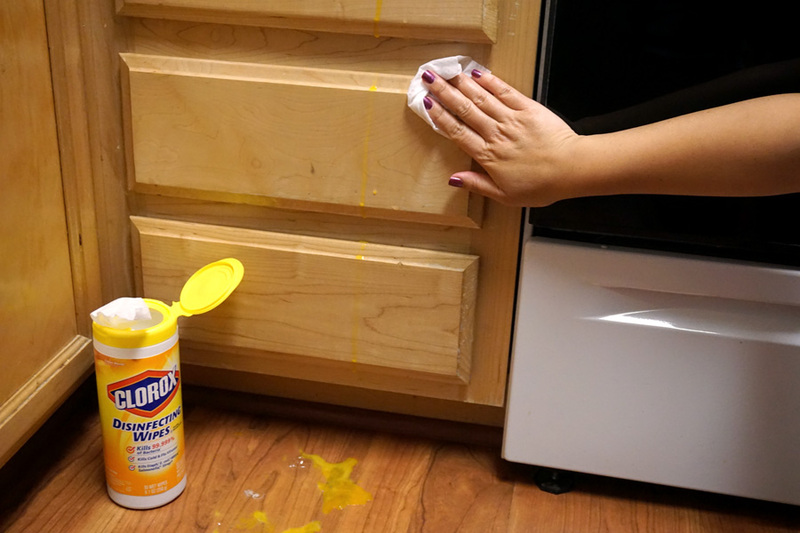 I had to be extremely careful to open each one and immediately wipe away any egg away before it leaked into the drawer itself. I grabbed another wipe to lightly clean the fronts too. 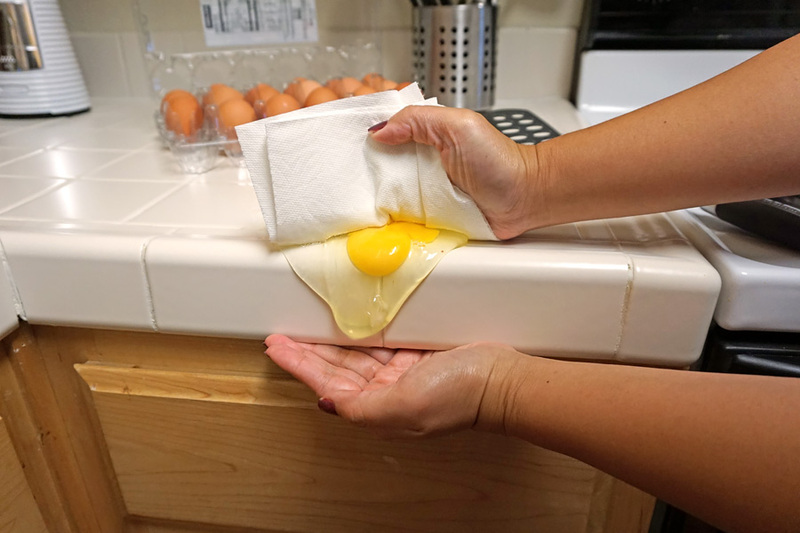 Lastly, I tackled the puddle of egg left on the laminate flooring. That took a few more Clorox wipes but the surface was left clean and dried pretty soon after. We have a small kitchen space with little room to spare. So, I’m glad it was quick and easy to prepare area again to finish up the food. Ah, what an ordeal. Well, that was a huge red flag for me. We all make mistakes but, as things happened one thing after another, my nerves just couldn’t handle it. It’s just not possible to be perfect super-mom no matter how hard I try. Fortunately, that’s not what my family expects of me either. After dinner, they helped put everything away so I could relax the rest of the night. So, despite the huge mom fail (from my own viewpoint, not that of my family) it wasn’t all that bad.